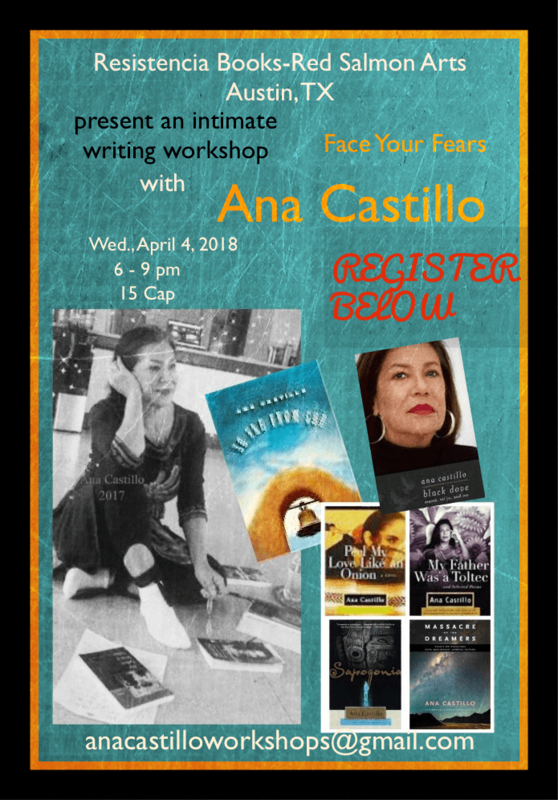 Ana Castillo (June 15, 1953-) is a celebrated and distinguished poet, novelist, short story writer, essayist, editor, playwright, translator and independent scholar. Castillo was born and raised in Chicago. She has contributed to periodicals and on-line venues (Salon and Oxygen) and national magazines, including More and the Sunday New York Times. Castillo’s writings have been the subject of numerous scholarly investigations and publications. Among her award winning, best sellling titles: novels include So Far From God, The Guardians and Peel My Love like an Onion, among other poetry: I Ask the Impossible. Her novel, Sapogonia was a New York Times Notable Book of the Year. She has been profiled and interviewed on National Public Radio and the History Channel and was a radio-essayist with NPR in Chicago. Ana Castillo is editor of La Tolteca, an arts and literary ‘zine dedicated to the advancement of a world without borders and censorship and was on the advisory board of the new American Writers Museum, which opened its door in Chicago, 2017. In 2014 Dr. Castillo held the Lund-Gil Endowed Chair at Dominican University, River Forest, IL and served on the faculty with Bread Loaf Summer Program (Middlebury College) in 2015 and 2016. She also held the first Sor Juana Inés de la Cruz Endowed Chair at DePaul University, The Martin Luther King, Jr Distinguished Visiting Scholar post at M.I.T. and was the Poet-in-Residence at Westminster College in Utah in 2012, among other teaching posts throughout her extensive career. Ana Castillo holds an M.A from the University of Chicago and a Ph.D., University of Bremen, Germany in American Studies and an honorary doctorate from Colby College. She received an American Book Award from the Before Columbus Foundation for her first novel, The Mixquiahuala Letters. Her other awards include a Carl Sandburg Award, a Mountains and Plains Booksellers Award, and fellowships from the National Endowment for the Arts in fiction and poetry. She was also awarded a 1998 Sor Juana Achievement Award by the Mexican Fine Arts Center Museum in Chicago. Dr. Castillo’s So Far From God and Loverboys are two titles on the banned book list controversy with the TUSD in Arizona. 2013 Recipient of the American Studies Association Gloria Anzaldúa Prize to an independent scholar. Spring 2016 Publication of BLACK DOVE: Mamá, Mi’jo, and Me (Feminist Press) released to critical acclaim. It is the recent recipient of a 2016 International Latino Book Award in the category of autobiography and the recipient of the 2017 LAMBDA Award in the category of best bisexual non-fiction. Her most recent novel, GIVE IT TO ME is the recipient of the LAMBDA AWARD, 2015. June 2015, Ana Castillo was given the Lifetime Achievement Award in literature for her “literary contributions to the Latino/a community, and commitment to the betterment of our younger generations” by Latina 50 Plus, a motivational organization based in the Bronx, NY. The classic, award winning collection of essays 20th anniversary updated edition of Massacre of the Dreamers was released Nov. 1, 2014 (UNMP) The award winning novel in verse, WATERCOLOR WOMEN, OPAQUE MEN will be re-released Fall, 2016 by Northwestern University Press in a new edition. WATERCOLOR WOMEN, OPAQUE MEN (novel-in-verse, Curbstone Press, 2005, recipient of Independent Publishers Book Award) was released in an updated edition by Northwestern University Press, Feb., 2017. Ana Castillo makes her home in New York City and the New Mexico desert.